New Craftsman pants in Fast Dry Polyamide. Soft, comfortable and quick drying material with high durability. Spacious holster pockets that can be tucked into front pockets. Rubber button to minimize scratching. Back pockets with reinforced inside. Hammer loop. Extra belt loops in largest sizes. Ruler pocket with knife button. Leg pocket with zip, phone pocket, ID-card pocket and extra pocket. Pre bent knees for optimal fit. 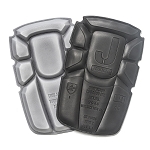 Knee pockets in durable polyamide with reflective piping and adjustable in two positions.